On Thurs., September 13th at 6:00 PM, STANLEY & SON, sold 647 Linn Street with the Minimum Bid of $20,000 and approx. 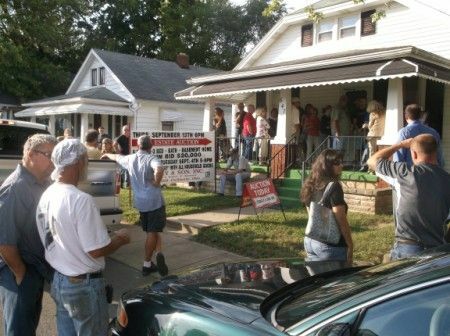 50 buyers attended this Real Estate Auction. The Home was sold “Turn Key” as-is. The bidding was fierce and when the air cleared & the highest bid was in…..it SOLD for $67,000! 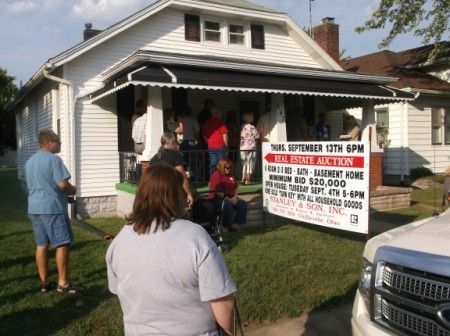 The same evening at 6:45 PM, STANLEY & SON Sold the corner of Piatt & Laurel Street at Auction; Minimum Bid was $10,000….the home was in need of many repairs….the bids were quick & calculated….the highest bid reached $21,000! Do you have real estate that needs sold & traditional listing for sale hasn’t worked for you? Maybe the benefits of STANLEY & SON, INC. auction service could work for you just like they have for all these sellers of 2012– Edna Burton Trust, 157 Acres w/$2,500 per acre Minimum & SOLD for $7,200 per acre; Coal Run Enterprises, Commercial Property $150,000 Minimum & SOLD for $325,000; Mr. Bates & Mr. Isaac, 5 Wooded Acres & Cabin $10,000 Minimum Bid SOLD for $40,000; The McNeal Family homes-$50,000 Minimum SOLD for $116,000 & $25,000 Minimum SOLD for $58,250; RC & NM Enterprises, 206 Vinton Co. Acres Minimum Bid of $500/Acre SOLD for $1,700 per Acre; Mr. Dispennett’s home w/Minimum Bid of $70,000 SOLD for $126,500; The Grubb Family’s houses: Minimum of $20,000 SOLD for $36,000; the Renison Estate house Minimum $56,000 SOLD for $107,000; the Sawmill in McArthur Ohio Minimum of $10,000 SOLD for $376,500; and 80 Wooded Acres in Jackson Co. Minimum of $100/Acre and SOLD for $750/Acre. Being a 2 story home on an approximately 40’ by 148’ level City lot with a connected addition. The property has two gas meters and 2 electric meters. The home consists of 4 Rooms; 2 Bedrooms and 1 Bathroom. Home offers a spacious living room; kitchen with top and bottom cabinetry and pantry; the upstairs offers two bedrooms with closets and a full bath compliments the upstairs with shower over tub, sink, toilet, and storage closet. This property also offers a connected addition. In years past, the area was utilized as a retail sales storefront. It is no longer used for commercial enterprise. The addition offers a spacious open floor plan layout with a bathroom and washer & dryer hook up. The property offers a private backyard leading to the 1 car garage with rear alley access. Real Estate Terms: $20,000.00 Min. Bid, $2,000.00 down at time of sale by cash or check w/ photo ID; balance & possession upon delivery of deed on or before Oct. 13, 2012, Joseph P. Sulzer, Atty., conducting closing, 14 South Paint St., Chillicothe, Ohio 45601, 740.774.6320; property offered free & clear prior to closing, sold in its present as– is condition. All information provided is to be utilized as a guide and announcements made by the Auctioneer from the podium take precedence over any and all previous statement or printed material. No liability exists regarding the information contained in any printed matter for its accuracy, errors or omissions. Bidding is open, just call out, raise your hand or watch the ring personnel…they will assist you and try to get answers to any questions you may have prior to bidding. Statute of Limitations: Any action or suit of any kind must be commenced within one year from the date when the cause of action or suit occurred or it will be forever barred. The Right of Action or suit will begin to run on the date of breach, damage or injury is sustained & not when the resulting cost, damage, harm or loss is discovered. This Agreement will be exclusively construed & governed in accordance with the laws of the State of Ohio, without regard to its conflict of Laws Principles. The exclusive jurisdiction & venue for any controversy or claim between the parties shall be the State of Ohio, County of Ross, City of Chillicothe, by binding arbitration.